Rectangular static racks. Colour: black. Perched on the counter-top this glass-sided cabinet can really boost sales by tempting customers with hot, fresh food. 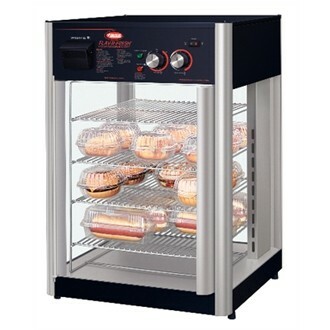 The controlled levels of heat and humidity inside the cabinet keep food warm, crisp & moist ready to serve. Rotating or static racks available. Access through rear glass door. Improved presentation increases impulse food buys. Dimensions : 730(h) x 492(w) x 530(d)mm.